After 11 days at 65°, my pre-Prohibition pilsner is down to a final gravity of 1.008. This equates to 5.5% abv and 83% attenuation. The low mash temperature definitely did the trick for drying out the beer! On Saturday, January 30, I dropped the temperature down to 40°, and on Sunday dropped it again to 35°. 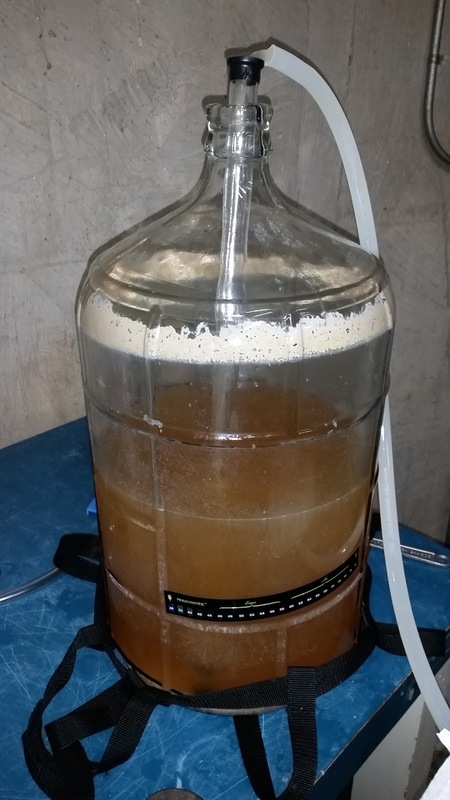 This evening (Sunday, January 31), I kegged the beer. I am fining it with 3/4 tsp. of gelatin in 1/2 cup of water, mixed in with the beer. I’m force-carbonating and lagering at a temperature of 34°. The beer has cleaned up pretty nicely, although is still pretty hazy. I expect the gelatin should take care of that in short order. I can definitely pick up the corn in the grist, as expected for a beer in the American pilsner style. This entry was posted in kegging, pilsner, Pre-Prohibition Pilsner and tagged 3P, D3P. Bookmark the permalink.